Martha Stewart Menopause Support is a 100% vegetarian supplement that helps maintain hormonal balance and allows the body adjust to lower estrogen levels. Fruit and vegetable extract provide the body with essential minerals and vitamins, which are required for proper metabolism and nourishment. Vitamin E (as d-alpha-tocopheryl succinate): Reduces occurrence of hot flashes. Chaste berry extract: Stimulates production of progesterone and inhibits production of prolactin, thereby restoring some hormonal balance in the body. This results in relief from menopausal problems like hot flashes and night sweats. Red raspberry leaf extract: Helps regulate painful and erratic menstruation in women nearing menopause. Red clover extract (aerial parts): This has been used to reinstate hormonal balance. Red clover is also used to enhance fertility and sexual function. Black cohosh root extract: Rich in isoflavones that mimic the properties of natural estrogen and prevent the body from displaying menopause symptoms like hot flashes, night sweats, vaginal atrophy, loss of bone density, mood swings, etc. Soy isoflavones: Contains isoflavones or phytoestrogen, which reduces menopausal symptoms. It provides relief from hot flashes, night sweats, insomnia, moodiness and irritability. The recommended dosage for this supplement is 2 capsules daily. This supplement contains soy and is not suitable for individuals who are allergic to soy. Price per bottle containing 60 capsules is $16.99. The website also offers a one-time $5 discount. This supplement bears the NSF mark and is certified by the Public Health and Safety Organization. However, the company does not seem to offer any guarantee or have any money back returns policy in place. 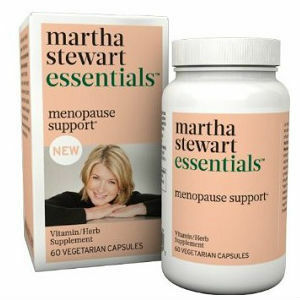 Is Martha Stewart Menopause Support Worth Buying? This is a completely natural, vegetarian supplement, fortified with fruit and vegetable extracts. It contains some ingredients commonly used in menopause supplements. This cheaper price can be attributed to the fewer active ingredients it contains and to the fact that this product. Jackie Horowitz	reviewed Martha Stewart	on August 13th	 and gave it a rating of 3.